Susan K. Marlow began writing stories when she was 10 years old. She obtained an elementary education degree and taught in Christian schools before homeschooling her children. Now over 20 years later she is “back in the saddle” helping homeschooling families by teaching writing workshops as well as writing good historical fiction books for kids. Susan K. Marlow is best known for her Circle C Adventures book series. Set in California in the 1880’s, this series features a girl named Andrea Carter and her horse Taffy. It has become a very popular book series with an off shoot series for younger readers called Andi and Taffy. 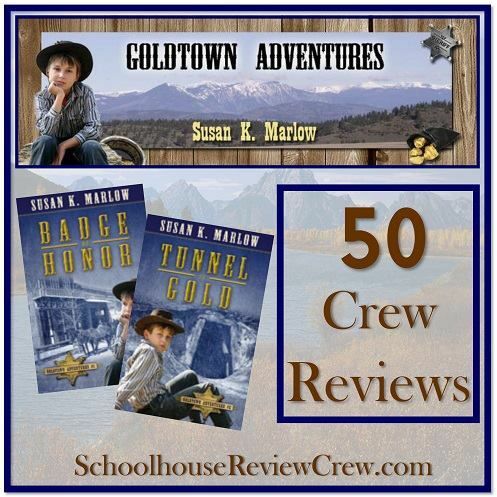 The newest Susan K. Marlow series is called Goldtown Adventures. Combo set: Books 1 & 2 for $13.95. Set in 1864, 12 year old Jem his sister and cousin have many adventures along Cripple Creek. Jem leads the way in many adventures including finding out why Cripple Creek is losing water as well as getting trapped in an old mine. Through all of his adventures and mishaps Jem is given opportunities to learn trust in God. There are two books in the Goldtown Adventures series with a third book due out November 2013. The first book Badge of Honor has Jem and his sister trying to figure out why Cripple Creek is running dry. They also have to learn to get along with their cousin who has just moved from back East. Jem also has to learn how to be comfortable with his father obtaining a new job: sheriff. The second book is Tunnel of Gold. Jem is caught in the middle of a miner’s riot. He quickly finds out the trouble is over a gold mine that has been “played out” or not producing gold anymore. Jem has to think quickly to save the Midas Mine. To deepen the learning, Susan K. Marlow is offering free downloads of study guides that go with each book. The guides are 24 or 25 pages long. The activities are quite extensive and well thought out. You can access these downloads at http://www.goldtownadventures.com/Study-Guides.html. A big thank you to Jill of ClarkClan Craziness for writing this introductory post.